Mad Hatters Film Camp has launched an all-new programme for kids and teens who are passionate about music videos. 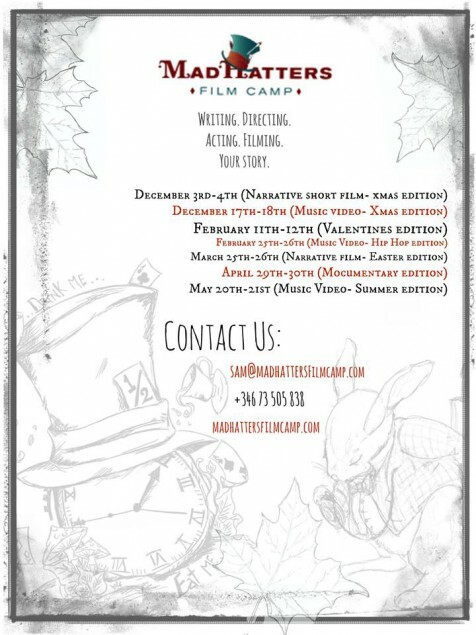 Reynard Productions launched the Mad Hatters Film Camp to offer creative kids and teens from 8 to 18 years of age the opportunity to experience the art of filmmaking at a professional level. The camp offers courses in music video production or narrative film during high energy weekend and summer sessions. As part of the program, students produce a series of short films which can be used to compete in film festivals around the world. Your kids will gain first-hand experience in the entire process of film production, from idea generation and storyboard creation all the way through to post-production. What differentiates the Reynard Productions programme from others is that it is run by a professional group of filmmakers from the UK and Los Angeles who offer this Film Camp at schools worldwide. Reynard Productions is credited with producing and directing countless films and music videos so your aspiring Spielberg will get a first-hand look at how real filmmaking comes together. The end goal of Mad Hatters Film Camp is to inspire kids and teens on the real art of film and video production. As so much of today's world is based on effective communications, these are tools that students can utilise throughout their lives as powerful levers to their personal and professional development. Students will have the unique opportunity to write, act and direct in their very own short film. They will also get to do singing, songwriting and recording their own song in a professional studio and starring in a music video!